This post is part of a once-a-day-month-long-blogging-bonanza with my pals Amanda Hollinger, Monica Wyche, and Ami Worthen. It’s the summer of 1984. We’re 12 and 13 years old, and we’re having a sleepover at Jenni’s house, which means there will be little to no sleep but much laughter, dancing, singing, candy, and potato chips. The T.V. is on from the moment we arrive until we leave, locked on MTV. In 1984, MTV’s video inventory was, shall we say, limited? 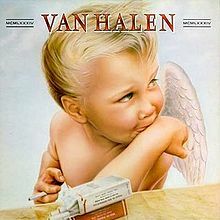 Van Halen’s “Jump” is on heavy rotation, and we take turns doing David Lee Roth-style jumps from the top of the couch and swooning over Eddie Van Halen on his synthesizer. The song is on when we finally slip into sleep, and it’s on when we wake to Jenni’s Mom calling, “Pancakes!” in the morning. Ha! I brought my pencil!